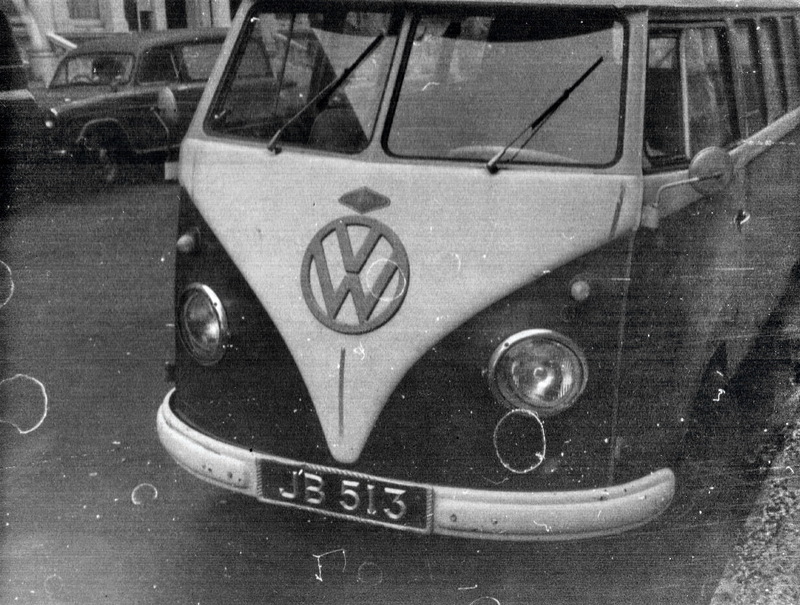 Before the era of worldwide car hire and aeroplane travel – one might say, before 1965 – people travelled between continents by passenger liners and cargo boats. 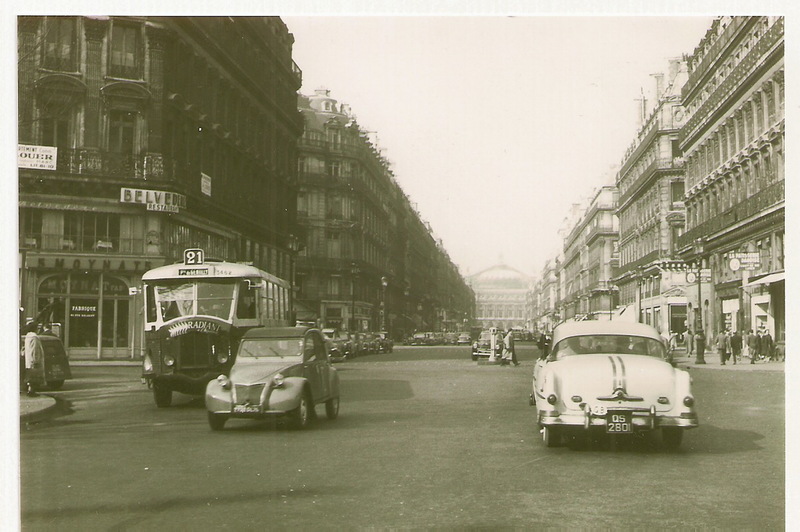 Car ownership was limited to wealthy and to important people, and factory production was slow as the world’s economies, with limited supplies of steel, glass, lubricants and rubber, began to recover from the vast cost of WW2. 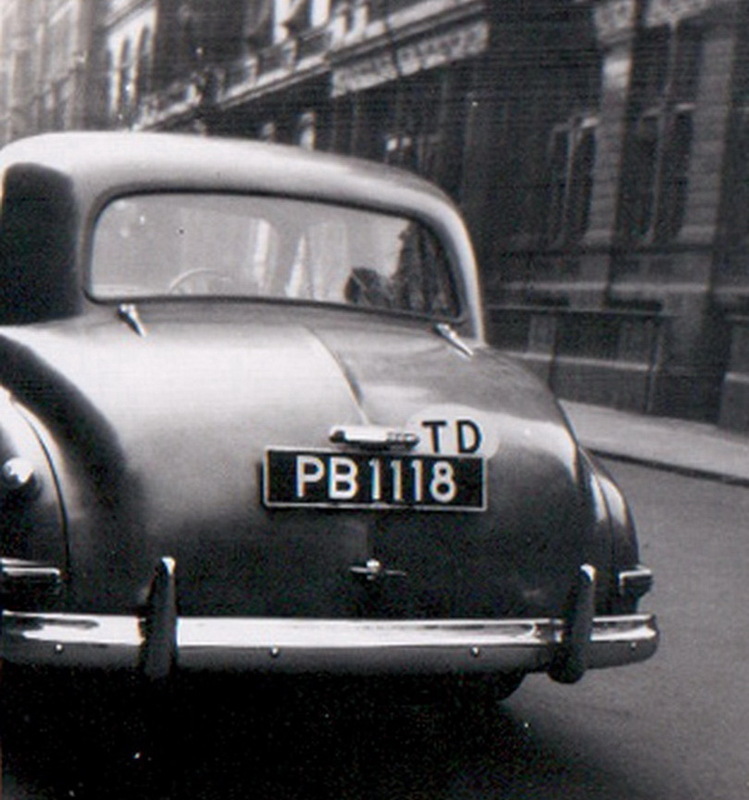 It was due to the steel shortage that many post-war British cars had body panels made in aluminium, a material still in good supply, but no longer wanted by the war machine for aircraft production. 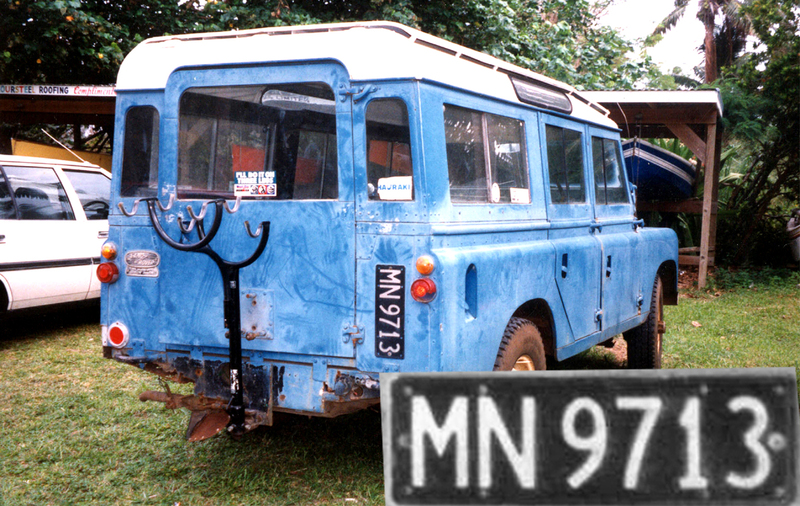 That serendipitous circumstance was to become an important reason for the 60 years of success of the Land Rover, the body of which would not rust on the beaches of the Cook Islands…..
…..or the sweltering jungles of Malaysia…. 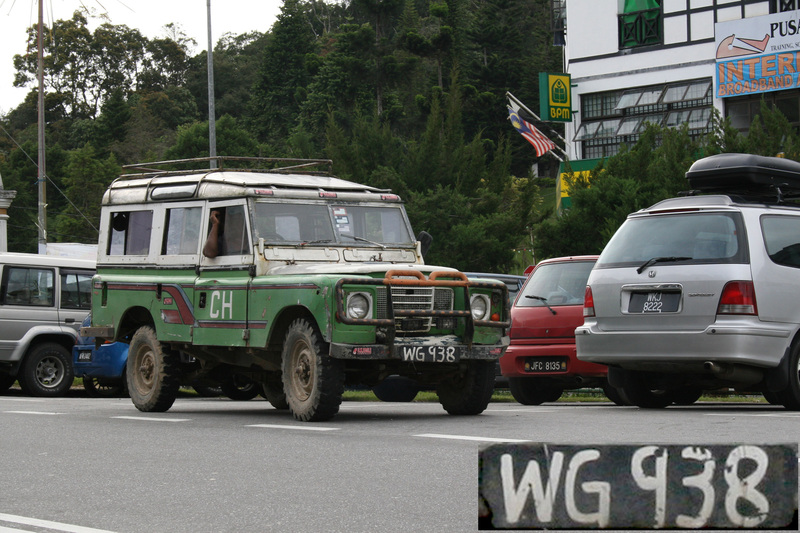 W is the code for the Federal Territory of Kuala Lumpur, seen in Kedah. 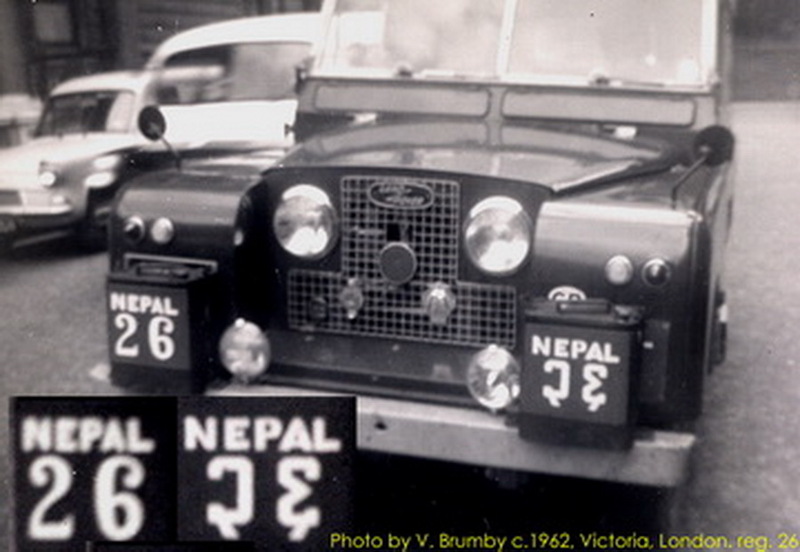 For a long period after peace was declared, a second-hand vehicle would sell for more than a new one, as any new products were built purely for the export markets, so as to earn foreign currency. Only a few, privileged, UK-based, professional people were allowed to buy new cars, for work of national importance, such as doctors, farmers and mobile engineers. A trick used by the rich, was to travel to another country, including to the US and Canada, and to buy a new car there, under their local export scheme! 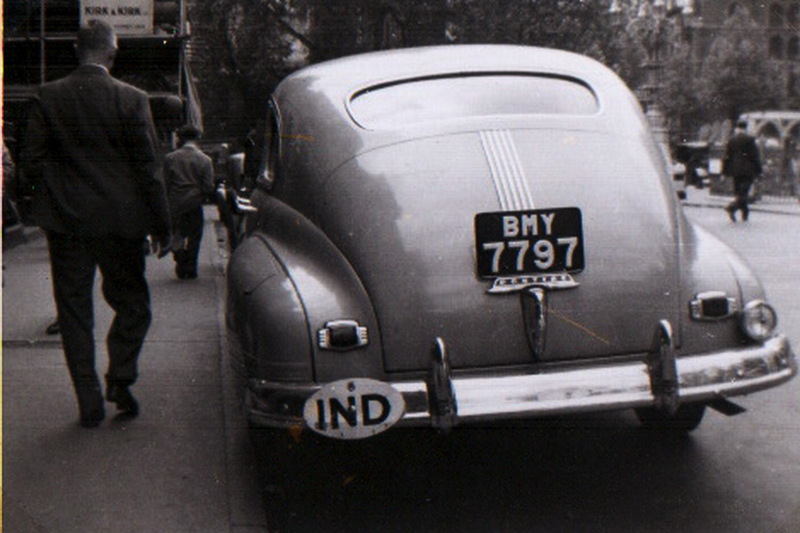 In this era, of the 1940-1960s, many technical, administrative and educational personnel were sent to distant parts of the globe to perform work on behalf of the allied governments, which needed to rebuild and modernise their territories overseas as well as their domestic infrastructures. When those people travelled, they were entitled to buy a car to take with them, as this would count as an export sale; of course, no spare vehicles would have been available for them to buy in the countries for which they were bound. 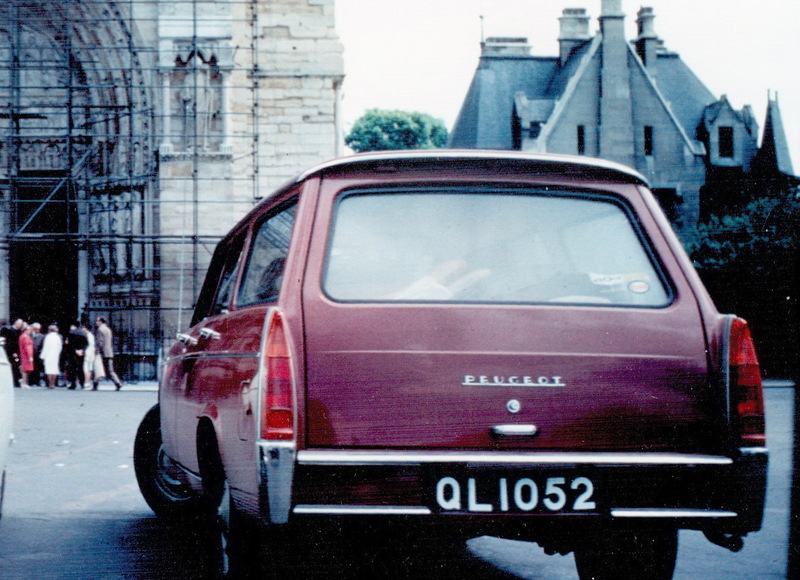 France marked these duty-free export cars with the special, red, Temporary Transit plates……. 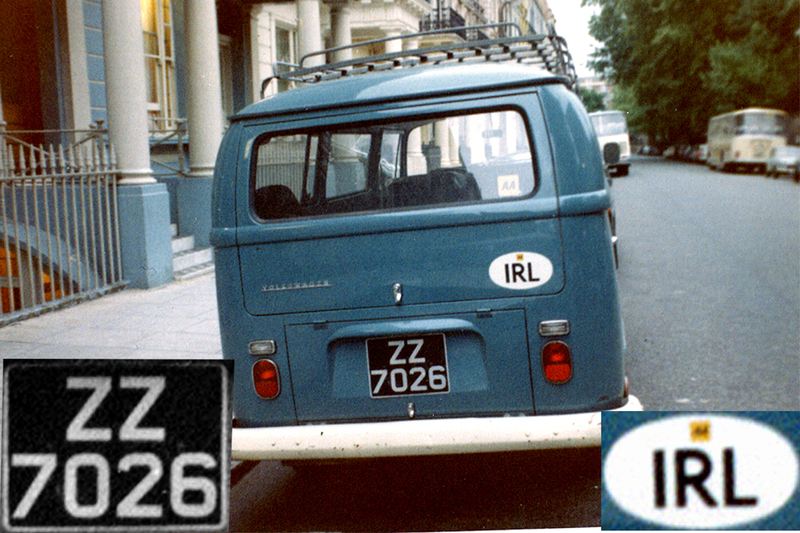 ……Italy by their EE ‘Escursione Estranieri’ (Foreign Traveller) series………..
……….Eire, using the prefix ZZ………. …………Denmark by their red lining within the regional code letter. K -Copenhagen………. 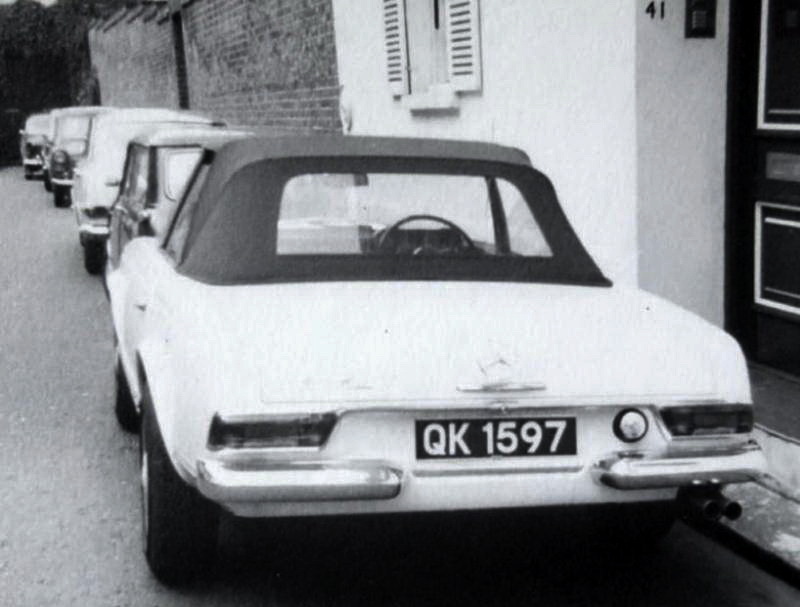 whereby a new buyer could collect his new (British-made) car in UK and use it for up to three months before his supplier arranged for its shipping to the eventual destination for which it was bound. 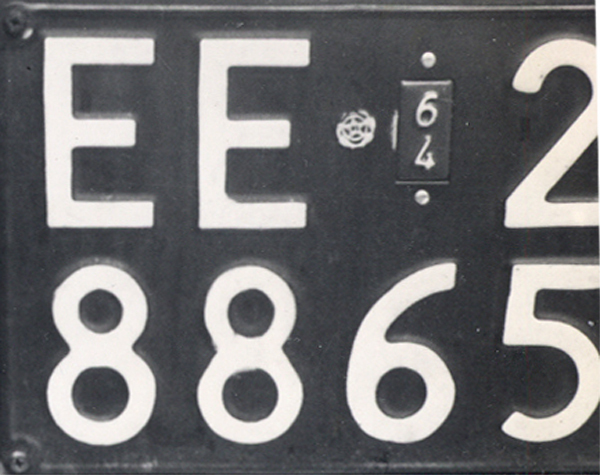 In later years, these HDES plates were marked with with a yellow rim and from 1 Jan 1973, for the obligatory new white/yellow reflective plates, a red rim. 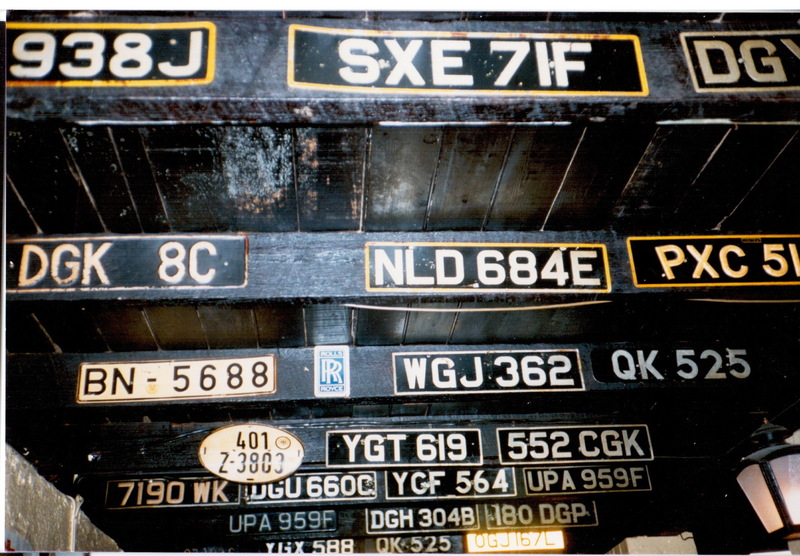 Some HDES examples seen in a now-defunct motor museum in Queenstown, New Zealand. Brumby archive. 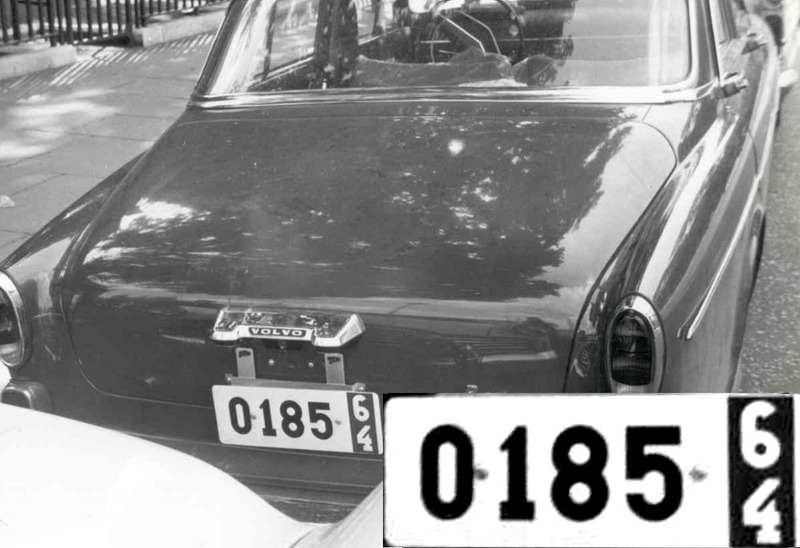 Sometimes, but not always, when such a car returned to Britain, these original HDES plates could be re-mounted and some of these can be seen still today, looking innocently as if they have never been away. If you see one, interview the owner – you might win a Bhutan diplomatic or a Tristan for your collection! 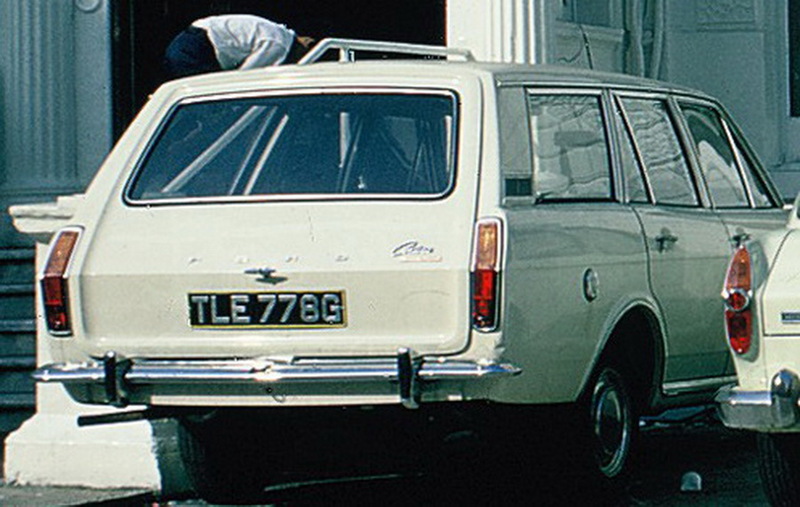 This 1968 (G) Mk.2 Ford Cortina has been somewhere and come back to adopt its HDES identity. Where had it been??? 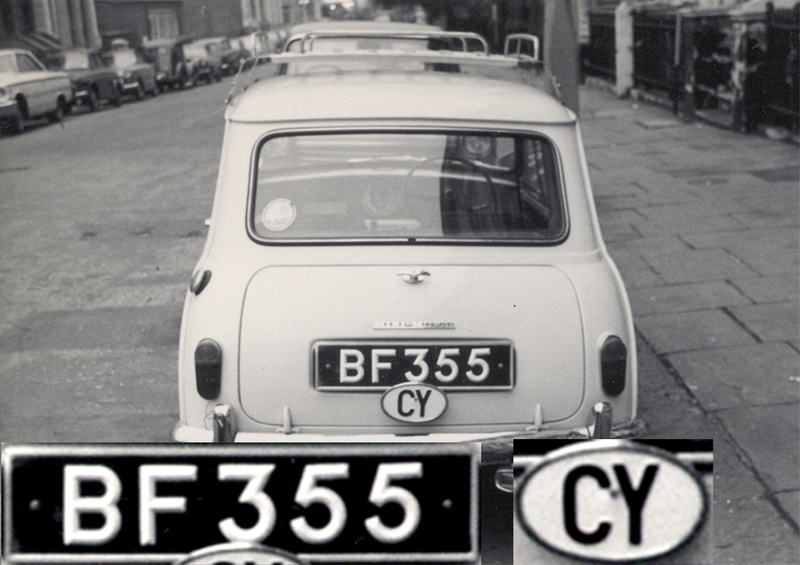 If someone wished to buy a non-British-built car car in Britain, for export, that car would be given a British Temporary Import plate from the ‘ Q’ series. This was still the age of the ship and cars were easily and cheaply carried as part of the passengers’ luggage cargo. 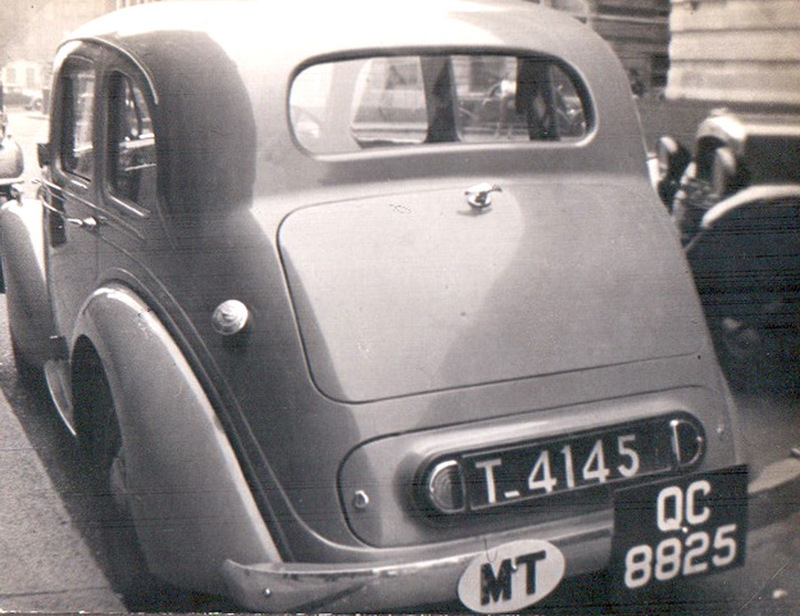 When their tours of service were at an end, and knowing that new cars would be difficult to buy when they arrived back in Europe, this army of colonial civil servants, miners and infrastructuralists – and also thousands of military personnel – would return to Europe with their foreign-registered cars aboard their ships. 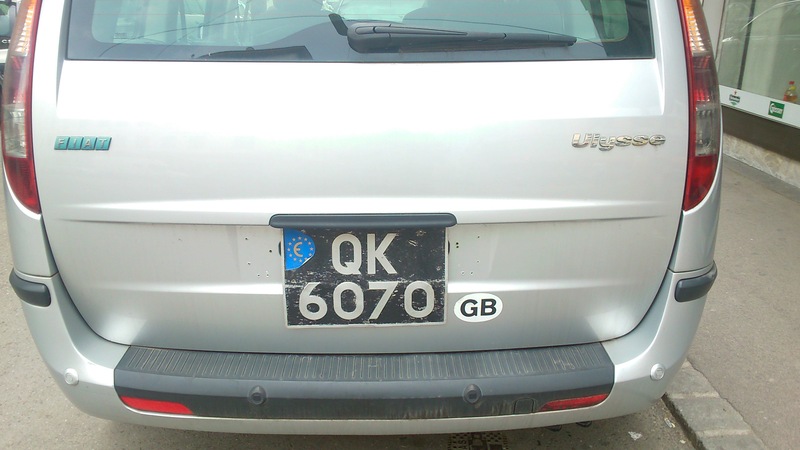 Many vehicles circulated for up to a year on the foreign plates, usually carrying the international ovals, to identify their country of registration. 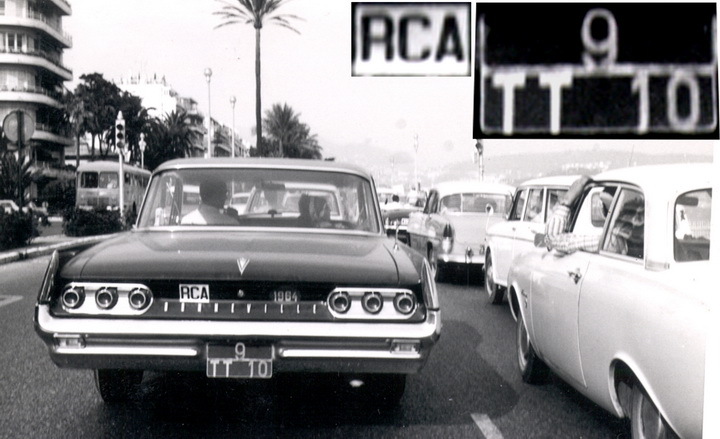 Sometimes, however, they changed plates immediately at the port of re-entry and in England, the spotters of the period would particularly look out for shiny new aluminium plates issued with the codes of the three great dock cities, London, Liverpool and Southampton, where the motor organisations, the AA and the RAC, would undertake the complicated paperwork of the re-importation on the owners’ behalf. Usually, the garage-man who changed the plates, would throw the dismounted foreign ones into the boot, in case the owner needed them. Usually the driver didn’t particularly want them, and if, later, a youthful car-spotter, recognising the new dock-issued numberplates, interrogated him with sufficient intent, he would willingly open the boot and hand them over! 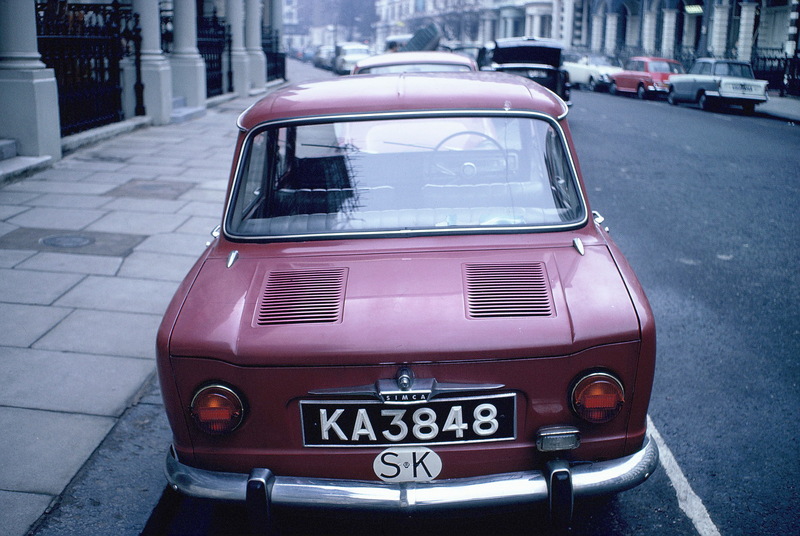 Thus many a collection was born and to this day, the writer wishes that plates had not gone on to assume a money value – for they had once simply been a trophy of a well-run, low-cost hobby, as might be a stuffed hunting trophy, or a prized fish! 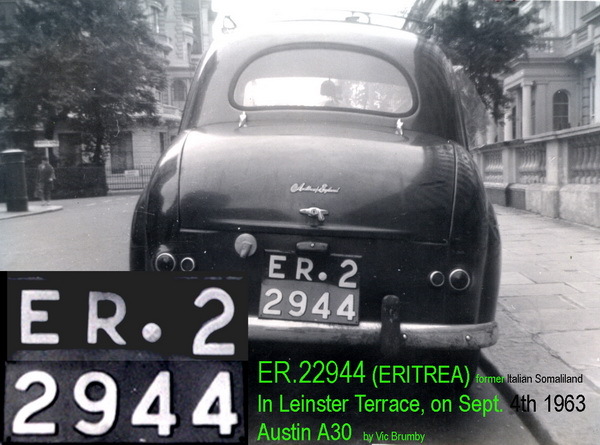 Ubiquitous air travel and cheap and efficient international car rental combined to bring the collapse of the passenger shipping lines, and has brought these big quantities of re-imported cars to an end; it is mostly diplomatic corps plates which we see today, by way of rare-country sightings. 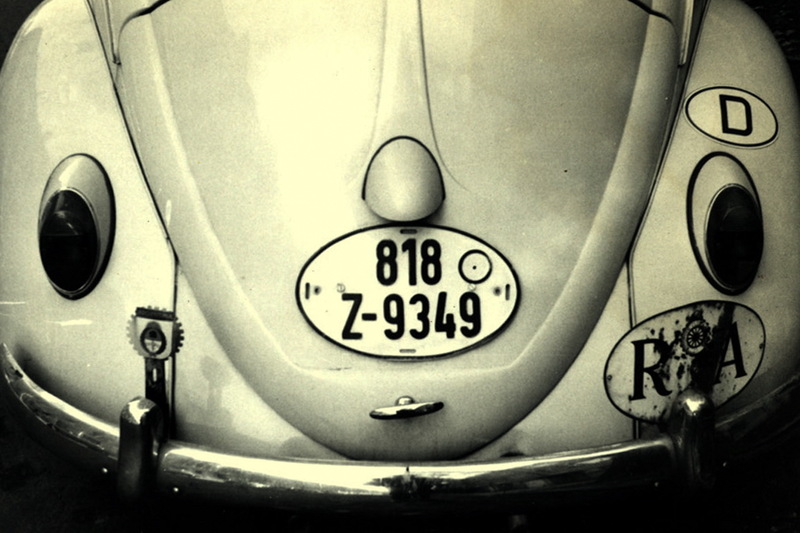 To counter that loss to the spotter, an increase in general prosperity also permits the modern enthusiast to travel the world and to see the plates of a country in their native setting. 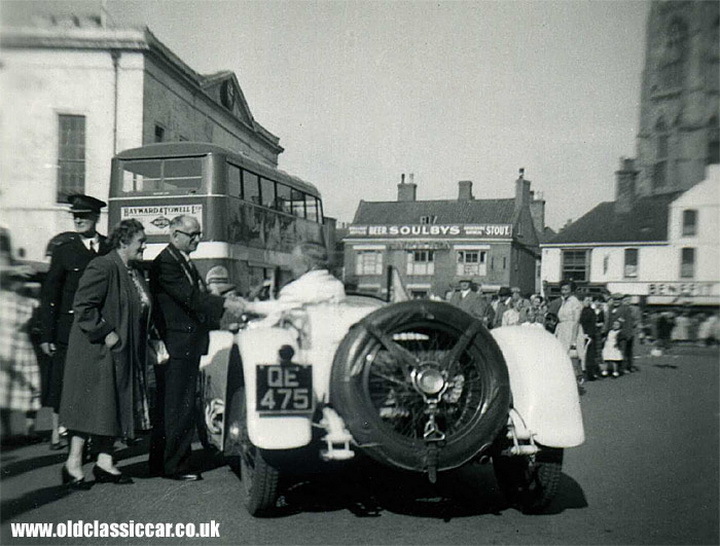 Here are a few of the odd sightings of vehicles returning from the Outside World to Britain and Europe during the 1940’s 1950’s and 1960’s. 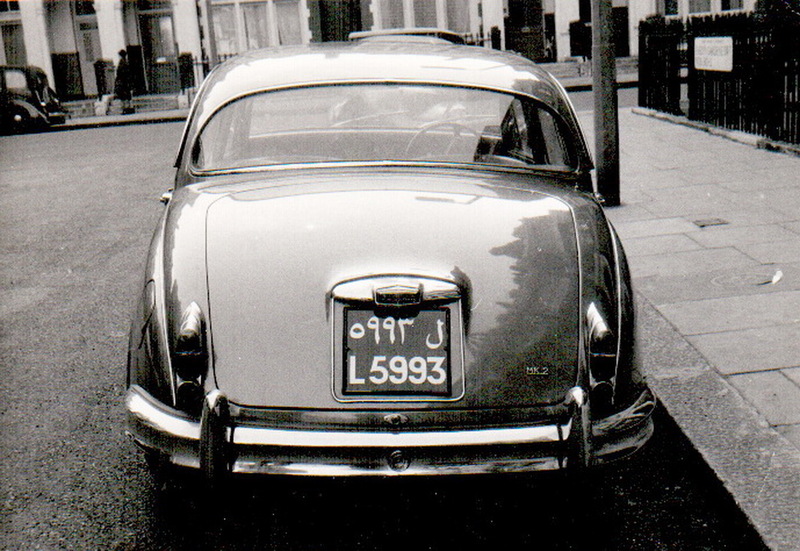 Tanganyika – John Pemberton’s shot of a Peugeot 203 from Dar-es-Salaam circa 1954 in London. DS D 770. 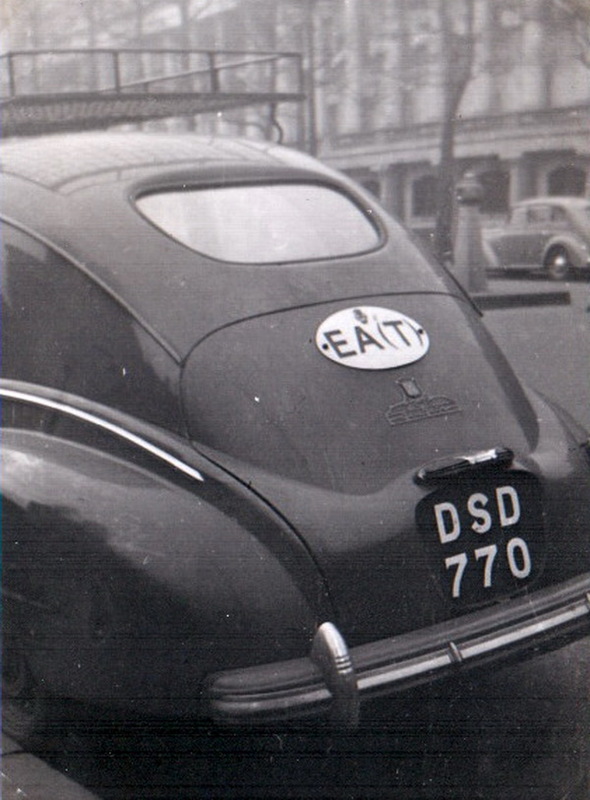 Note the bracketed ‘ T ‘; worldwide, parentheses on ovals were only used on the four codes for British East Africa – EA(T), EA(K), EA(Z)and EA(U) – though they were not frequently used. 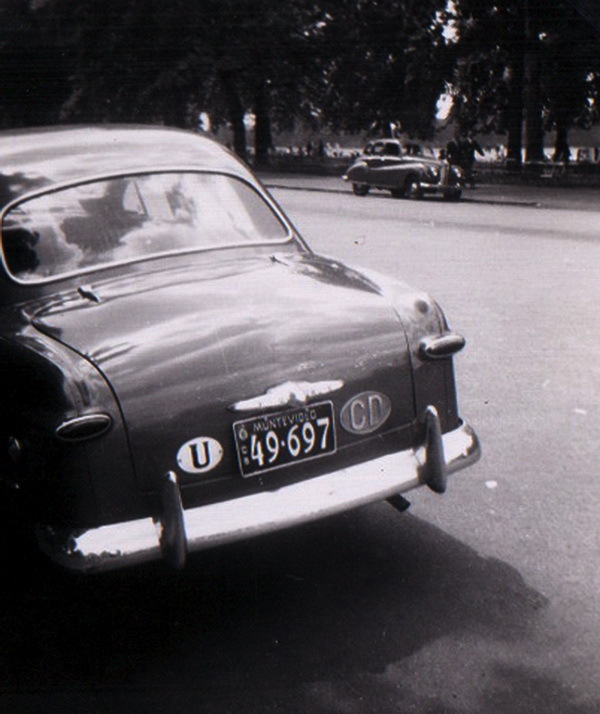 C/D 49-697 A diplomat returns from a tour in Montevideo, seen in Hyde Park circa 1952, on a Simca Aronde. Rare U oval picture. Pemberton archive. Aden must have been one of the hottest, dustiest, dreariest postings for a soldier in the British services. 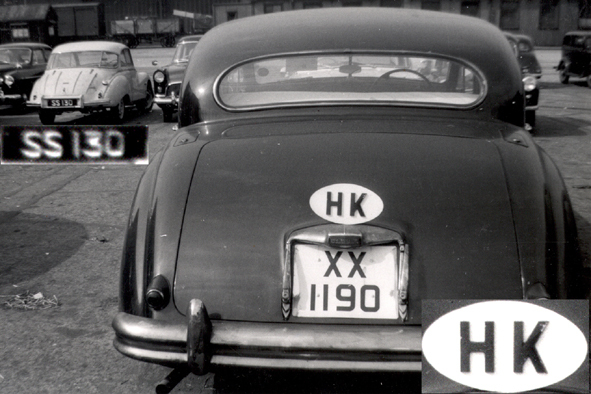 However, there probably aren’t any Jaguars driving round out there in 2013, so times must have been easier then, as we see an officer’s smart Mk.2 2.4 returned to London’s Kensington in 1963, after a recent posting there. 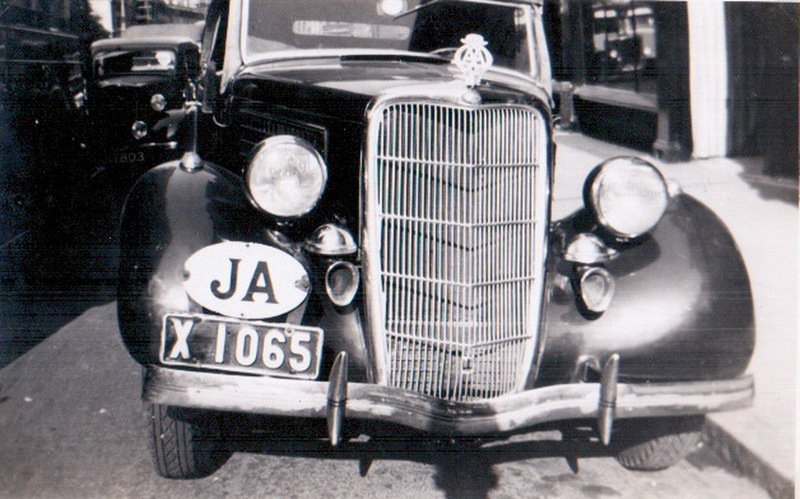 The first few years of Aden vehicles were registered under the registration system of India, as were Christmas Island and possibly one or two of the Straits Settlements. It is not understood why Aden chose the letters L, M and finally N for its plate prefixes during that series.. 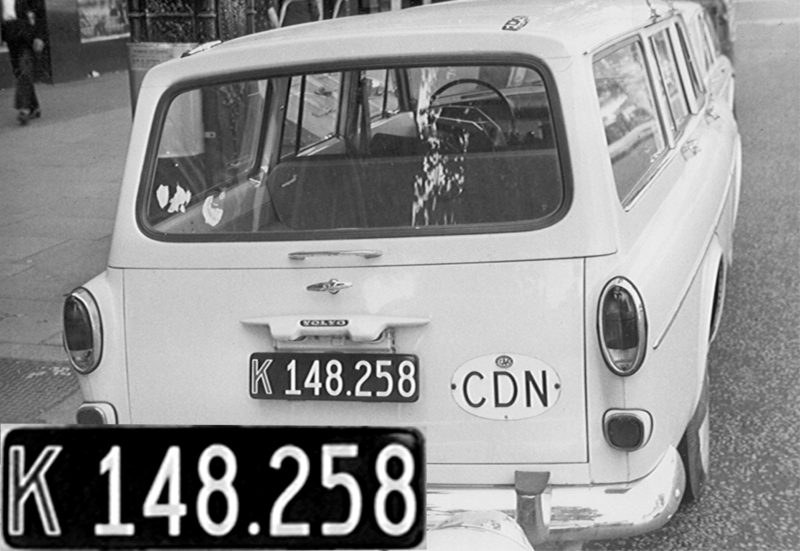 So – we can see that these were good days for seeing plates from all over the free world – and, strangely, the communist bloc countries remained among the rarest of sights. Of course, China, North Korea and Albania followed the communist path, forbidding citizens to own cars and with the remarkable exception of John Pemberton’s China Diplomatic (shown elsewhere in this Blog) nothing was seen from those benighted lands. Not many photographs were taken and fewer still survive, lost in house-m0ves, cast away by surviving relatives as being of no interest etc. Work done by such members as Pieter Lommerse, who has trawled so many sources to gather historic pictures of Turkey, Greece and Cyprus, is of inestimable value to all collectors. The Legend of The Larsson Library is whispered of in exalted circles! Any shots you may have will find a welcome home in the Blog, or else simply post them in for scanning and return, to Victor Brumby at 8 Cleeve Court, Streatley, Berks. UK – RG8 9PS. You are currently browsing the archives for the Britain category.